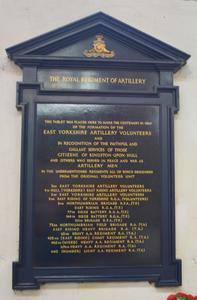 THIS TABLET WAS PLACED HERE TO MARK THE CENTENARY/ YEAR IN 1960 OF THE FORMATION OF THE EAST YORKSHIRE/ ARTILLERY VOLUNTEERS AND IN RECOGNITION OF THE/ FAITHFUL AND GALLANT SERVICES OF THOSE CITIZENS OF/ KINGSTON UPON HULL AND OTHERS WHO SERVED IN PEACE AND/ WAR AS ARTILLERY MEN IN THE UNDERMENTIONED REGIMENT/ 3RD EAST YORKSHIRE ARTILLERY VOLUNTEERS 2ND EAST YORKSHIRE ARTILLERY VOLUNTEERS 2ND EAST RIDING OF YORKSHIRE/ RGA VOLUNTEERS 2ND NORTHUMBRIAN BRIGADE RFA T.F. EAST RIDING RGA T.F. 77TH SEIGE BATTERY RGA T.F./ 165 SIEGE BATTERY RGA T.F. 251ST BRIGADE T.F. 73RD NORTHUMBRIAN FIELD BRIGADE RA T.A. EAST RIDING HEAVY/ BRIGADE RA T.A. 62ND HEAVY A.A. REGIMENT RA T.A. 422 EAST RIDING COAST REGIMENT RA T.A. 462 MIXED HEAVY/ A.A. REGIMENT RA T.A. 676 A.A. REGIMENT RA T.A. 440 HUMBER LIGHT A.A. REGIMENT RA T.A.